Risk from internal exposure is 200-600 times greater than risk from external exposure. See this, this, this and this. 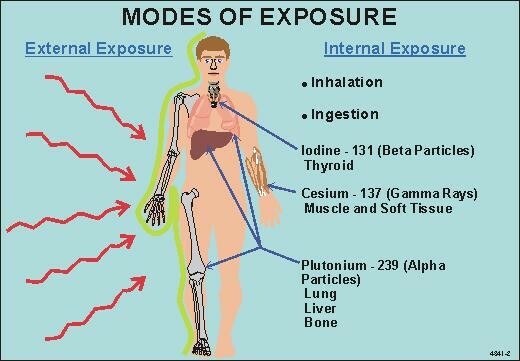 cesium-137 and radioactive iodine – the two main radioactive substances being spewed by the leaking Japanese nuclear plants – are not naturally-occurring substances, and can become powerful internal emitters which can cause tremendous damage to the health of people who are unfortunate enough to breathe in even a particle of the substances, or ingest them in food or water. “….Mixing Apples (External) and Oranges (Internal) Moreover, radioactive particles which end up inside of our lungs or gastrointestinal track, as opposed to radiation which comes to us from outside of our skin are much more dangerous than general exposures to radiation. Radioactivity generates radiation by emitting particles. Radioactive materials outside the the body are called external emitters, and radioactive materials located within the body are called internal emitters. Internal emitters are much more dangerous than external emitters. Specifically, one is only exposed to radiation as long as he or she is near the external emitter. For example, when you get an x-ray, an external emitter is turned on for an instant, and then switched back off. But internal emitters steadily and continuously emit radiation for as long as the particle remains radioactive, or until the person dies – whichever occurs first. As such, they are much more dangerous. There are few natural high-dose internal emitters. Bananas, brazil nuts and some other foods contain radioactive potassium-40, but in extremely low doses. And – as explained above – our bodies have adapted to handle this type of radiation. True, some parts of the country are at higher risk of exposure to naturally-occurring radium than others. Over the long term, the big threat to human health is cesium-137, which has a half-life of 30 years. It is cesium-137 that still contaminates much of the land in Ukraine around the Chernobyl reactor. Cesium-137 mixes easily with water and is chemically similar to potassium. It thus mimics how potassium gets metabolized in the body and can enter through many foods, including milk. Cesium-137 that is dispersed in the environment, like that from atmospheric testing, is impossible to avoid. Iodine-131 has a half-life of eight days and is quite dangerous to human health. If absorbed through contaminated food, especially milk and milk products, it will accumulate in the thyroid and cause cancer. (In addition to spewing massive amounts of radioactive iodine 131, Fukushima also pumped out huge amounts of radioactive iodine 129 – which has a half-life of 15.7 million years. Fukushima has also dumped up to 900 trillion becquerels of radioactive strontium-90 – which is a powerful internal emitter which mimics calcium and collects in our bones – into the ocean.). The bottom line is that there is some naturally-occurring background radiation, which can – at times – pose a health hazard (especially in parts of the country with high levels of radioactive radon or radium). But cesium-137 and radioactive iodine – the two main radioactive substances being spewed by the leaking Japanese nuclear plants – are not naturally-occurring substances, and can become powerful internal emitters which can cause tremendous damage to the health of people who are unfortunate enough to breathe in even a particle of the substances, or ingest them in food or water. Unlike low-levels of radioactive potassium found in bananas – which our bodies have adapted to over many years – cesium-137 and iodine 131 are brand new, extremely dangerous substances. And unlike naturally-occurring internal emitters like radon and radium – whose distribution is largely concentrated in certain areas of the country – radioactive cesium and iodine, as well as strontium and other dangerous radionuclides, are being distributed globally through weapons testing and nuclear accidents. Do we need to move from our homes? What is there to do that is proactive protection. Leaving us with this information is only useful if I know how to act.